Sometimes it’s hard for me to remember, but I spent 7 years of my life slowly, bit by bit, coming to a greater understanding of what the Bible is and what it means for me. And honestly, who has the time to do that? Certainly very, very few people other than those who are preparing themselves for ministry like I was. And so, as someone who has invested my life into the study of the Bible and discipleship to Christ, I have a great responsibility to communicate what I have learned with others so that the body of Christ can become healthier and more alive. To that end, I think I need to do a better job being honest about what the Bible is, and how we can use the Bible as a holy tool to seek a greater understanding of God, for the purposes of strengthening our faith (that is, our beliefs in action). I would encourage anyone who has the time to read the article (It’s very long, but you really need to read it all). But let me summarize from a Presbyterian pastor’s perspective what I would hope people would understand about the Bible. 1. It was written by human beings. It was written by humans who were devoted to God, inspired by God, and serving God, but it is not perfect. It’s a guiding light, telling us how faithful (and unfaithful) people have lived their lives and understood God, but it’s not an answer book. It’s a question book, and to be taken seriously, we can’t just assume the first thing we think is correct. Not to mention that the first manuscripts have never been seen, and all we have are translations of translations and copies of copies. The Old Testament didn’t have vowels and the New Testament didn’t have spaces! Over the centuries, translations have changes and theological judgment have been made in the passing on of Scriptures, and it’s important to open our eyes to those realities if we are seriously trying to understand God. 2. The Bible is contradictory, and that’s ok. There are two creation stories. There are two stories of the Great Flood. There are four stories of the Gospel and two of Jesus’ birth. The Bible contradicts itself all the time – because it was written by many different contradictory people! This reminds us that our faith isn’t monolithic, but there’s room for disagreement. Which brings me to my next point. 3. It’s not worth killing anyone over the Bible. After all, who do we worship – God, or the Bible? Who do we believe in? Christ, the Living Word, or the written word (and which version)? Most people would read that and think that it’s pretty easy not to kill anyone over the Bible, but historically, that’s not true. And how many gay men and women (boys and girls!) have been killed or driven to suicide because we’ve collectively decided that homosexuality is the sin we need to focus on, and not – for example – deceit or judgment? 4. We need to do a better job reading the Bible. Serious biblical scholarship starts with seriously reading the Bible. And not even reading the whole thing in a year – going slowly through it, on a three or four year plan. Taking notes, thinking critically, and actually reflecting on what was said in worship. (Side note – studying the Bible seriously strongly promotes church attendance, to bring the knowledge gained individually to a community for interpretation, challenge, and support). If I had one wish for Christians, it would be that they would love God with their whole being and love their neighbors as themselves. If I had two wishes, the second would be that they would read the Bible to discover the need to love God and others for themselves. 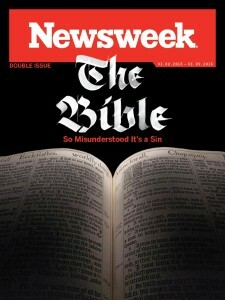 A final note: No one reads or interprets the Bible perfectly. We all sin, no matter how good our intentions in living out our faith. Christian faith doesn’t rest in ink on a page, but in a living Word and a moving Spirit. Paul wrote, “For the law of the Spirit of life in Christ Jesus has set you (or me, in some translations!) free from the law of sin and of death.” The law of sin and death is that which ties us to blind literalism, focused on the word and not on the God served by the word; the law of the Spirit of life in Christ Jesus is that same law, understood correctly as the law that binds us to follow where God leads. May we follow the law of the Spirit of life!